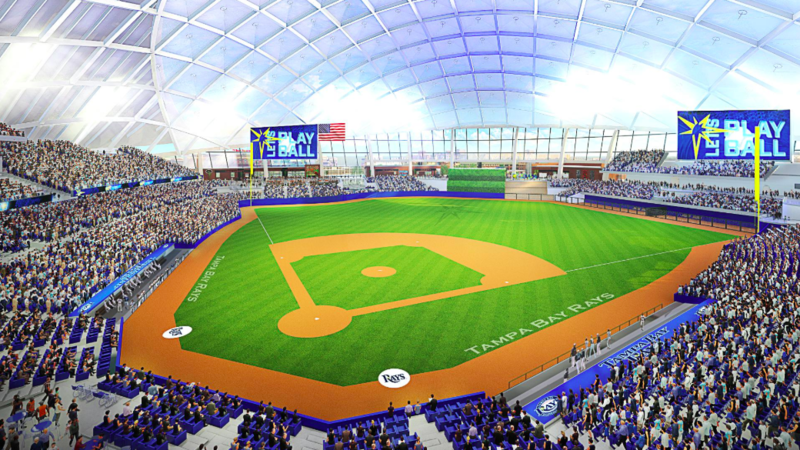 Tampa Bay Rays officials gathered today to reveal renderings and information about a new ballpark planned for Ybor City. Lingering questions about the choice of roof were quickly answered. The park will not have a retractable roof, opting instead for a translucent, fully enclosed roof and glass exterior walls. The translucent roof will “bring the outside in,” making good use of our Tampa sunshine while shielding fans from afternoon thunderstorms. All the utility of the Trop with none of the warehouse feeling. The 900,000 square foot ballpark will hold 30,842 people, making it the smallest Major League Baseball park. The shiny new space will feature plenty of fan-friendly amenities, including restaurants, a beer garden, an outfield market, a stingray touch tank (of course), co-work space, and more. The ballpark’s concourse will be open to the public when the Rays are not playing, making the space a year-round daily attraction. The park will employ some creative seating options, including “fountain seats” (literally in a fountain! ), “sand seats”, and “picnic suites”, which loosely resemble restaurant booths and are designed for multiple people to easily enjoy the game and each other’s company. As with any new stadium, parking is a concern. However, there are over 23,000 parking spaces within a mile of the ballpark and a 1,000 space garage will be constructed adjacent to the building. The total project will cost over $892 million and is slated for completion in 2023. TreeHoppers Features Zip Lines, Sky Surfing, and Much More!